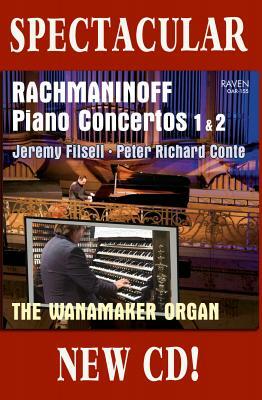 In a landmark pairing, the lyric majesty of the Wanamaker Organ is interwoven with Grand Piano as Peter Richard Conte and Jeremy Filsell triumph in two beloved Rachmaninoff masterpieces for Piano and Wanamaker Organ. Here is the Wanamaker Organ at its lyric and most enchanting as the sheer thrill of Jeremy Filsell's piano virtuosity is interwoven with the matchless string division, profound bass and limitless color-play of the world's largest playing musical instrument. The mighty Wanamaker has the tonal resources of three symphony organs spread among 28,750 pipes. 16-page CD booklet includes biographies, background and a full specification.